Charles O’Donnell has been named Manager of New Business at the Georgia Tech Fan Relationship Management Center (FRMC) in Atlanta, GA. O’Donnell will oversee the new ticket sales staff and new business initiatives. 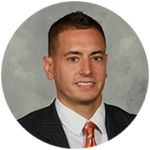 O’Donnell spent the last three and a half years with the Philadelphia Flyers, most recently as a Senior Client Development Executive where his team set the season ticket renewal percentage record of 95% in 2016. Prior to his time at the Flyers, he worked as a Music Agent at APA, Talent & Literacy Agency in Beverly Hills, CA. At APA, O’Donnell worked with clients including Imagine Dragons, AWOLNATION, Rise Against, Yellowcard, Sublime with Rome, Jack’s Mannequin and many others. In 2012, prior to his promotion to Agent, O’Donnell was recognized by Variety as a top Assistant in Hollywood. Originally from Reading, PA, O’Donnell has two Master’s Degrees (University of Maine ’14) and Alvernia University (’09) and received his Bachelor’s Degree from Penn State in 2008. O’Donnell began his duties July 24, 2017.